LONDON--(BUSINESS WIRE)--A leading customer analytics solutions provider, Quantzig, has announced the completion of their latest article on the importance of customer experience management and how companies can improve customer experience. Maintaining a cordial relationship with customers is vital for businesses. Customer experience management helps companies in achieving this by serving online customers and understanding their choices and preferences. Companies leverage customer experience analytics to track consumer behavior, record support interactions, and question the reasons behind customer dissatisfaction to manage customer experience accurately. This strengthens the preference of a brand through differentiated experiences and improves revenues with new sales for the businesses. To know how Quantzig’s analytics and BI dashboards can help your company avail detailed information on real-time business performance, Book a solution demo now! 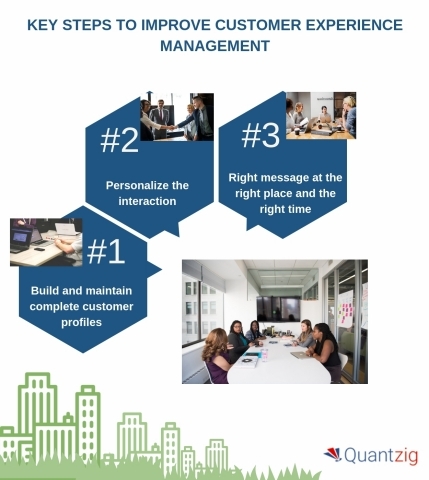 “Customer experience management improves the efficacy of businesses by boosting customer loyalty through memorable and valued customer interactions and minimizing costs involved in customer churn,” says a market expert from Quantzig. Companies necessarily need to build and maintain their customers' profiles to deliver a stellar experience to their customers. The data collected helps in analyzing customers’ journey at every touch point across multiple channels. This helps companies to improve their customer experience at specific touch points, personalize customers’ interactions, and make quick business decisions. Quantzig has been serving 55+ Fortune 500 companies in implementing customer experience management strategies for over a decade. Request a free proposal to know how our customer analytics solutions can help your organization in providing the best customer experiences. Companies need to utilize the information gained through various customer profiles to personalize the services they are providing. Services delivered on accurate customer analytics are more relevant and precise. This makes customers feel important and enhances their brand loyalty. Get in touch with our customer analytics experts to identify the right customer experience management strategies. Mapping customer analytics is crucial for companies to deliver the maximum value at each customer touchpoint. This improves customer experience and provides detail insights that can be implemented in marketing processes for the future. Delivering the right message at the right place and time helps in actively evaluating the time of purchase and the post-purchase experience. To empower your business with better customer experience management strategies, Request a free proposal today! Quantzig has announced the completion of their latest article on the importance of customer experience management.